I actually thought this film was more popular than it actually was. 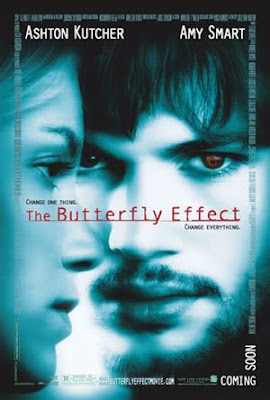 I'm pretty sure The Butterfly Effect went straight to DVD here, which is kinda weird because it has been one of those films I have always wanted to see. Even though it has Ashton Kutcher in it. I dislike him immensely. A young man, Evan (Ashton Kutcher), had serious blackouts which caused him to lose bad memories. But as he grows older, he figures out a way in which he can go back and find out what happened in those bad memories. Also, this enables him to go back and try and change what has happened in the past, especially trying to change the life of his best friend Kayleigh (Amy Smart), who he has been in love with and trying to protect all his life. While this movie has some pretty severe plot holes and the flashback scenes are done in a way which is particularly ugly, I did enjoy most of it. Mainly because it was a cheap rip off of some other mindf*ck movies, like Memento and The Sixth Sense. It wasn't as masterfully done, but in more capable hands could have been better. It zips forwards and back introducing us to new levels of reality from completely different time periods along the way. Kudos to the cast (excluding Kutcher) who had one character to play but had to portray so many different facets and personalities. Especially Amy Smart, who was particularly good in multi-roles. This is like a film with heaps of different films put into it. It starts off great, with some memorable scenes which keep you enthralled right until the credits roll. But it does slip off towards the end, and the ending may leave you with more questions than answers. This is probably due to those mega plot holes. I probably won't be watching the straight to DVD sequels any time soon, either. A nice thriller which is complex, but doesn't quite equal the sum of its parts.